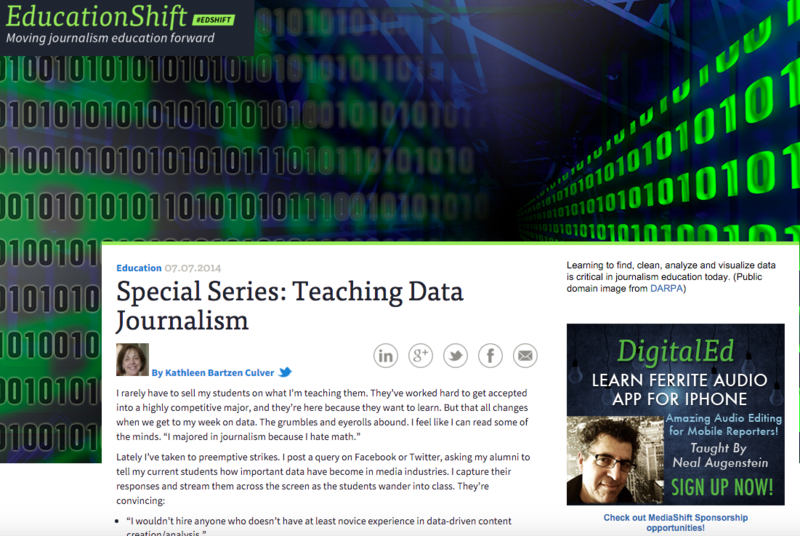 As part of my outreach efforts in journalism education, I serve as the curator of the education vertical for MediaShift (formerly PBS MediaShift), one of the nation’s most influential outlets focusing on digital media. Beginning in fall 2013, I conducted market research and developed a strategy for EdShift, which sits at the intersection of technology, innovation and communications education. Beginning with its early 2014 launch, EdShift’s traffic grew monumentally, increasing by 300% in its first 6 months. Over the ensuing two years, I have engaged 150 new writers to solidify the effort’s reach and influence. Twice-monthly #EdShift Twitter chats explore key questions facing communication educators and stimulate community engagement. We also run a continuing Remix series, focused on offering educators ideas for specific assignment or course design and materials to then adapt them in their own classes.